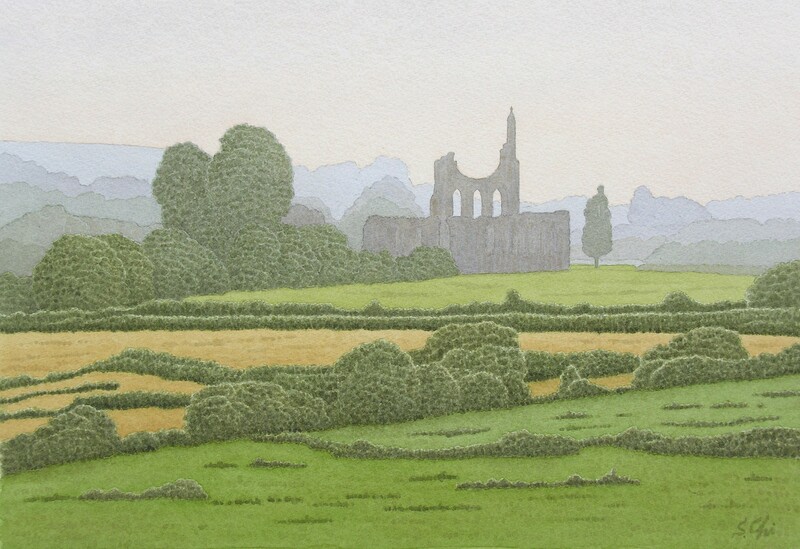 In the field beneath the Humbleton Hills, 2 miles to the northeast of Coxwold, there are the ruins of Byland Abbey. This Cistercian abbey was founded in about 1170 by the monks of Furness Abbey, Cumbria. They had difficulties. Since thirty six years had passed before they could build the new abbey. It was not until the late 13th century that it was completed. The abbey had to endure much hardship, suffering from the raids of the Scots. The abbey was dissolved in 1538. 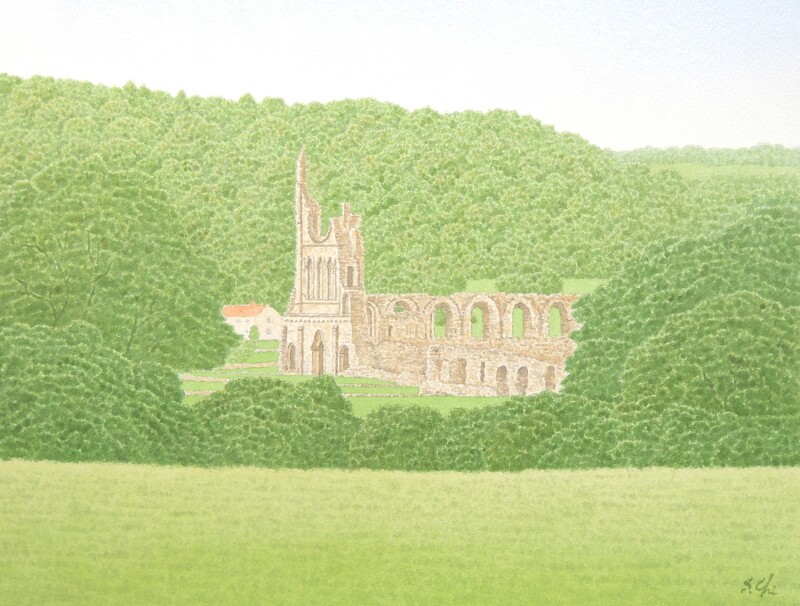 Byland Abbey has a story involving Edward II. Having failed in a reckless attempt to invade Scotland in 1322, he took shelter in the abbey once after losing a battle at Oldstead, a few miles to the north. He ran away to York, leaving his stores and treasures at the abbey. These were looted by the Scots who were chasing him. This deplorable episorde was one of his many actions, which led him to being regarded as the worst king in English history. 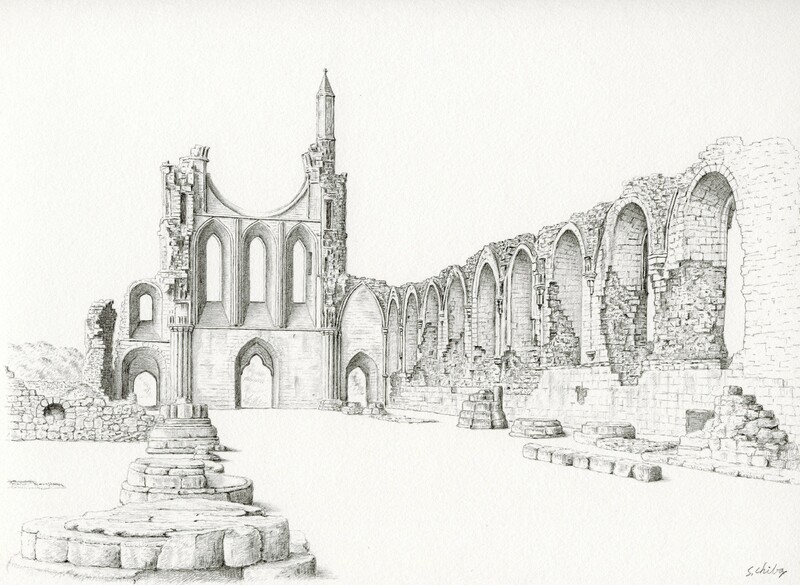 Byland Abbey was one of the largest ones of the Cistercian order in England. The ruins of the abbey have very dramatic and tragic appearance. Only some parts of walls of the nave and the south transept remain. Most of the abbey has been devastated to make mounds of debris. I could not believe there had been once a large religious house here. The upper half of the west front of the church fell down, leaving the half of rim of the rose window and the lower half. Only one small pinnacle in the north side rises to the sky. Symbolizing the tragic history of this abbey, it seemed to me maintains the last dignity of the abbey. On the floor of the south transept, coloured tiles of white, green, blue and yellow still remain. It is said once the whole floors of the abbey were covered with them. Seeing them in the ruins, I could only image the old glorious days of the abbey. Laurence Sterne is said to have often taken a walk around here. John Sell Cotman painted a romantic picture of the west front of the ruined abbey in watercolours in about 1809. When I visited in autumn, there were flowers in vases and pots at the foot of the walls and columns. They might be offered by the local people. The flowers at ruins were so vivid and impressive, and they contrasted the beauty of the life with the vanity of devastation intensely.